We want to eat at the right time. Otherwise we are not in harmony with the heating/digestive energy of the sun! And without the sun, our digestive power is lessened. Therefore, eating lots of food during that time is a super fast way to collecting ama (toxins) and weight gain! Here's the most important part of eating at the right time. Listen to our agni. If we are hungry and it's the right time, eat. If it's not the right time and agni is calling for food, let's say at 10 o'clock at night, you probably just need to go to sleep, because the night time fast is happening and agni is di. That is supposed to happen, where it's not the right time to eat at 10 o'clock at night, it's time for sleep. If we are hungry at the wrong time wait until the next window of when it's most appropriate to eat and then eat, so you can get it on a good schedule. The other thing is, if we're not physically hungry for food, it's okay to skip a meal. YIn fact, we often overload our bodies with food, too much food, too much in quantity, and we end up feeling over full and sluggish, and we might gain weight. So just listen to the body. Another thing, are you physically hungry? Do you feel it in your body, or are you bored? Are you stressed? Do you just want to taste something to satisfy one of your tastes? If that's the case, maybe go out, put on your sneakers, take a 5-minute walk, come back, see if you're still hungry, or do some breathing exercises. Activate another sense besides taste. Smell some essential oils. Put on good music. Activate another sense. We don't always have to be activating the sense of taste to satisfy us. We bring in the prana, the life that we're after, in so many other ways than just food. 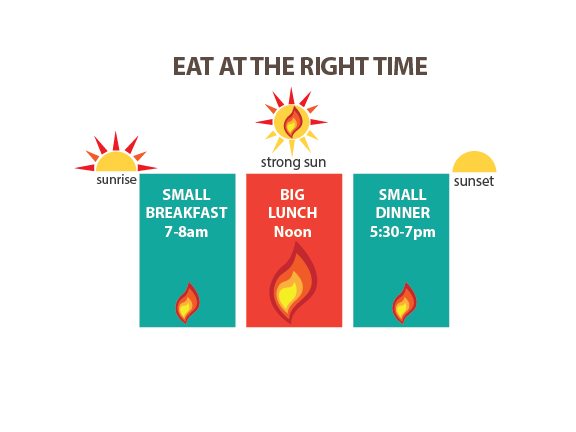 Below is the chart on the right times to eat! To see more videos, subscribe to my YouTube Channel. For more simple, modern ways Ayurveda can change your life, check out my book on Amazon.